If the below steps don’t work for you, please email chris@otree.org with details. error: Microsoft Visual C++ is required (Unable to find vcvarsall.bat). To fix this, install the Visual C++ Build Tools. When it asks you “Include sample games?” choose yes. Open your browser to http://localhost:8000/. You should see the oTree demo site. To stop the server, press Control + C at your command line. Install PyCharm, which you will use for editing your Python files. After installing, open PyCharm, go to “File -> Open...” and select your project folder (It’s usually C:\Users\<your_username>\oTree). 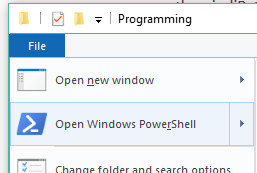 And set it to the location of your Python executable, which you can get in your command prompt by entering powershell -command "get-command python". Usually it is C:\Program Files\Python36-64\python.exe or C:\Users\<your_username>\AppData\Local\Programs\Python\Python36-64\python.exe. Once it’s configured, the imports at the top of an app’s models.py should look like this , not this. We recommend you upgrade on a weekly basis, so that you can get the latest bug fixes and features. This will also ensure that you are using a version that is consistent with the current documentation.